‘Abstract’ is a term too wide for its own good. It’s a word which is easily used to describe non-figurative work of all kinds, lumping decades of art history and individual approaches into a vague, messy conglomerate. In fact, non-figurative art can potentially be a platform for exploring so many different concerns – about shape, medium, but also deep deep emotion. Currently on in Liverpool are two shows which show the two sides of this. Both focus on mid-century abstractions, but put to very different purposes. 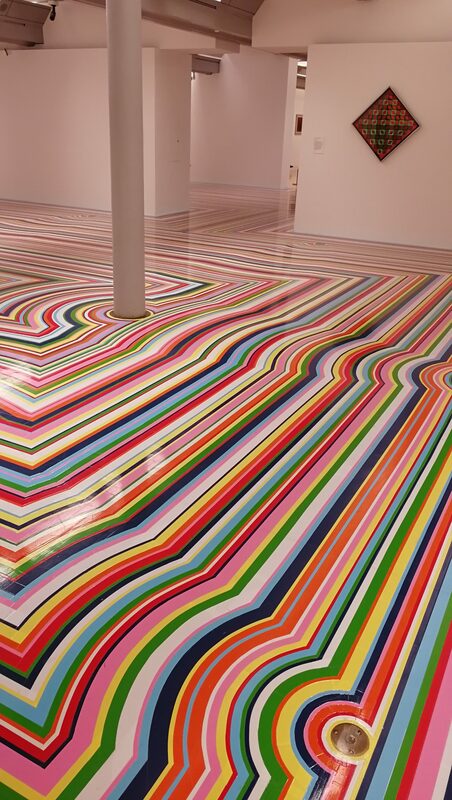 Tate’s newest long-term exhibition Op-Art in Focus is certainly a lot of fun. Op-Art is all about playing with your visual perception: the Tate shop are promoting lots of books about optical illusions around this exhibition, which gives an insight into some of what you find. 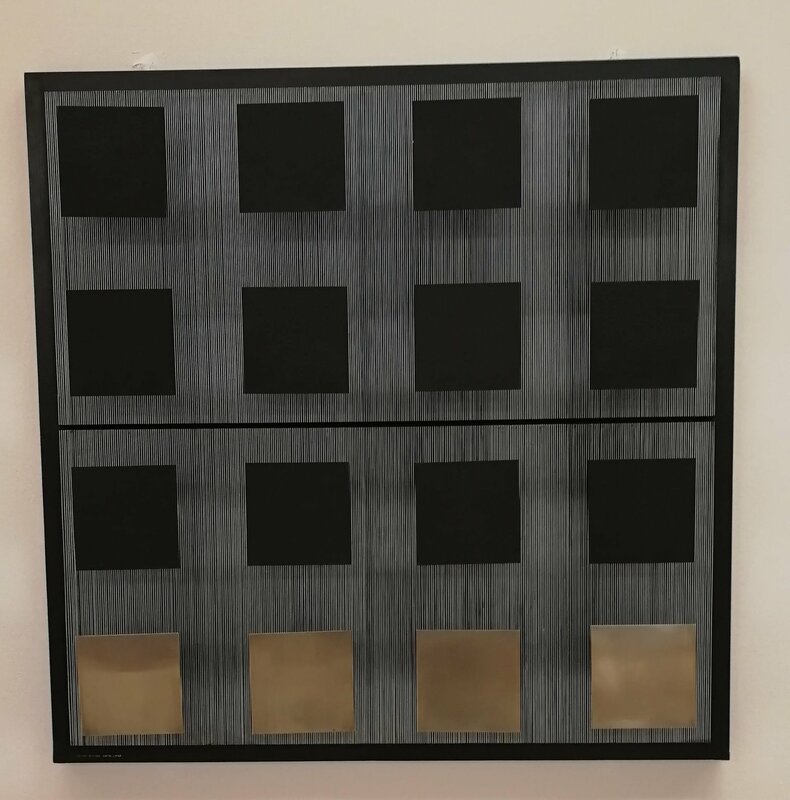 Enter and turn right, and you’ll come across pieces by Jesus Rafael Soto and Walter Leblanc which impressively and entertainingly make you wonder what precisely it is you’re looking at. The question I keep asking myself as I go around the show, however, is: what is the purpose of these games? I love Bridget Riley because I always feel she has a very clear intention in her work, that she’s challenging herself to find out what a 2D image can do as much as wanting to challenge the audience. There’s two Riley features in this exhibition, a large-scale painting and a series of screenprints, which lead you into a happy place where, beyond simply enjoy the effects, you also admire the effort and aesthetics of the work. I also end up liking Pol Bury’s 3069 White Dots on an Oval Background for its subtlety. I’ll also mention the floor: an incarnation of Jim Lambie’s Zobop designed to fit the gallery, it’s already appeared all over my social media and will no doubt continue to do so. More than just an Instagram sensation, though, I think it works really well as a piece of Op-Art. Its effects meant that I couldn’t look down when walking, a strange sensation that snippets of overheard conversations told me I was not alone in experiencing. But in my mind Op-Art always treads that fine line between value and gimmick. When it’s good, it challenges your expectations of what putting paint on a canvas can achieve, but there’s always the threat that it of slips into novelty. There’s a piece here by Julio le Parc which feels like a cheat, that’s neither challenging visual perception nor pushing boundaries of artistic possibility. It would look great as office art, though. I also find Blinky Palermo’s Ohne Titel almost entirely pointless, neither interesting nor successful in its stated aims. Overall, ‘Op-Art in Focus’ is a very solid overview of a slightly strange genre, both of its successes and indulgences, and I think visitors will really go for it. 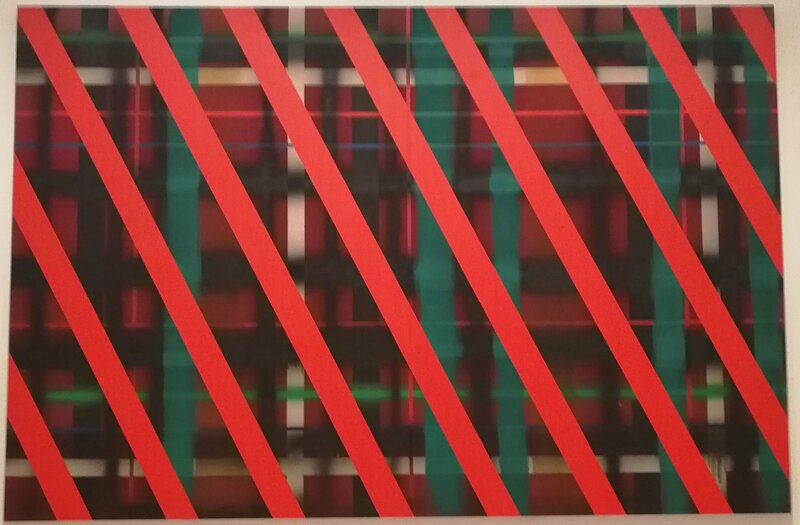 If Op-Art is all about the visual experience, then I found strong emotional resonance in Sean Scully: 1970 at the Walker, which brings together a selection of paintings and studies from the early year’s of Scully’s now very respected career. I was only cursorily familiar with Scully, but I enjoyed these paintings very much. Scully paints in lines. Straight lines, diagonal lines, grids. Lines in a variety of textures and colours. At first, it’s the boldness of statements made by the most foregrounded lines that stands out, the ways in which the grids and textures almost play off against each other to compelling effect. The only thing I’m personally not so convinced about is the colour scheme, which feels very of its time, very 1970s. So far, so surface: but spending time with each painting made me more interested in the what’s going on behind these lines. I end up feeling like there’s a whole other world going on, which these lines are dividing me from. And I find myself surprisingly emotionally affected by this mystery, this unknowability behind the apparent obviousness. I feel like I want to deeply explore each painting to understand the world it’s hinting at. There’s hints that this might be possible – Newcastle Bridge is certainly a real place – might there be a way into partaking in these scenes after all? In the second room, where patterns begin to more explicitly appear as though from ‘beyond’ the painting, it certainly seems so. The second room also focuses on experimental sketches – not perhaps as impressive as the final paintings, but certainly insightful into exploring the process of real-world ideas come to be condensed into their final abstractions. 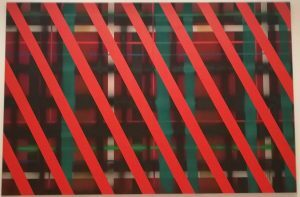 They confirm that his abstraction is about real and emotionally relatable subjects, of all the intentions that a line can have. This entry was posted in Current exhibitions, Exhibitions, Home and tagged abstract, art, Liverpool. Bookmark the permalink.